One of the many delightful aspects of a North Myrtle Beach vacation at the oceanfront Crescent Shores is that regardless of which beautiful, top-of-the-line condominium you choose at this North Myrtle Beach resort, you will have an oceanfront balcony. And it is from this oceanfront balcony that you can see the pool decks from both towers of Crescent Shores. Beyond these two pool decks you can see a wooden walkway that leads over the sandy dune that is laden with sea oats and out to the beachfront where white sand greets bare toes. The Atlantic Ocean is majestic and the sound of its waves coming ashore will be music to your ears when you stay at Crescent Shores. The northernmost pool deck at Crescent Shores has a slow-moving lazy river and a hot tub. All you need is an inner tube to enjoy the lazy river. Sit idly in the water while the current moves you all the way around the river’s route. You are also invited to sit idly in the hot tub. What a relaxing way to enjoy some time after you play a rigorous 18 holes of North Myrtle Beach golf. Soothe your muscles with the assistance of the warm water, jets and bubbles in this oceanfront hot tub. A second pool deck is located in front of the second high-rise tower at Crescent Shores. 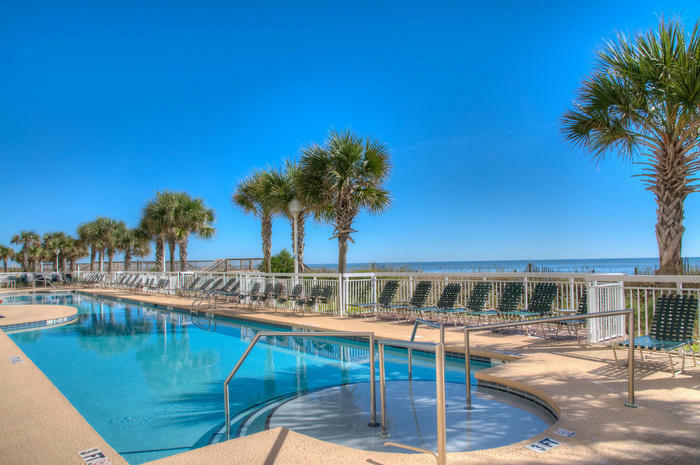 Remember that this oceanfront resort is comprised of two towers and each has its own pool deck, though guests of this North Myrtle Beach resort may use both pool decks. This oceanfront pool area has a large swimming pool in the center. On one side of the pool is a kiddie pool and on the other side there is a hot tub. Palm trees dot the landscape between the swimming pool area and the sandy dunes. It is a beautiful sight that your whole family can enjoy during your North Myrtle Beach vacation. In addition to these two pool decks, Crescent Shores is a North Myrtle Beach resort that features an indoor swimming pool. There are so many places to go swimming at this North Myrtle Beach resort. Your family will have fun exploring all of your options for a refreshing dip. Look around Crescent Shores, this North Myrtle Beach resort on the oceanfront, and you will find a fitness center. Make time to burn some calories during your North Myrtle Beach vacation. Hitting the gym could not be easier than it is when you vacation at Crescent Shores. The exercise room is just a few floors away from your fabulous oceanfront accommodations. The North Myrtle Beach rentals at Crescent Shores accommodate a larger number of people. Choose from a three-bedroom North Myrtle Beach vacation rental or a four-bedroom condo in North Myrtle Beach, South Carolina. These spacious North Myrtle Beach condominiums have room for at least 10 people and some of the units can accommodate as many as 16 for a memorable North Myrtle Beach vacation. The North Myrtle Beach condo rentals at Crescent Shores are all rated top-of-the-line, therefore their furnishings are quite nice. The fabrics, furniture and linen in each of these condos in North Myrtle Beach, SC are of high quality. Each of these North Myrtle Beach rentals has a kitchen that is beautifully filled with cookware, dishes and utensils. The full-size appliances are handy for reheating leftovers, making breakfast in the morning and keeping your drinks icy cold. When you have a kitchen at your fingertips during your North Myrtle Beach vacation you can return to your comfortable condo at lunch time for a sandwich or quick snack and then easily return to the pool deck or the oceanfront. Amenities in all of the North Myrtle Beach vacation units at Crescent Shores include a dishwasher in the kitchen, convenient washing machine and clothes dryer, and a microwave. There is a coffee maker so you can brew your own favorite flavor and then take a cup out to the oceanfront balcony to greet your North Myrtle Beach vacation day. There is also high-speed Internet access in each of these vacation rentals at Crescent Shores. You will find more than one television and at least one DVD player in each Crescent Shores condominium, too. Crescent Shores is a North Myrtle Beach resort that is part of the coastline in the Crescent Beach section of North Myrtle Beach, South Carolina. Your family will be near golf courses, seafood restaurants, live entertainment theatres and fishing piers. Find treasures at the nearby outlet malls and fishing tackle at the nearby fishing pier. Go horseback riding on the beach and visit a winery during your North Myrtle Beach vacation. Learn how to shag dance to beach music and ride the new Myrtle Beach SkyWheel during your stay. There is so much to see and do and you will be just minutes away from it all when you reserve a condo at Crescent Shores!